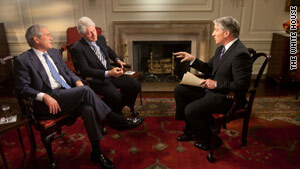 Former presidents Bill Clinton and George W. Bush discuss Haiti with CNN's John King. Washington (CNN) -- Former President Bill Clinton will travel to Haiti on Monday to meet with officials and deliver aid supplies to the quake-ravaged country, his foundation announced Sunday. Clinton, the U.N. special envoy to Haiti, will meet with Haitian President Rene Preval and other members of the local government as well as aid workers, to discuss how to proceed with recovery operations. The visit comes two days after President Barack Obama announced the formation of the Clinton Bush Haiti Fund, a major fundraising effort for victims of Tuesday's earthquake led by Clinton and former President George W. Bush. In a pre-recorded interview broadcast Sunday on CNN's "State of the Union," Bush and Clinton said the first goal of the fund is to get aid to Haiti right away to save lives. It also seeks to ensure that money keeps coming in after public attention begins to wan in the weeks and months ahead. The two predecessors to Obama as U.S. leader also said the Clinton Bush Haiti Fund (http://www.clintonbushhaitifund.org/) was intended to provide people with a safe place to continue donating money to help the Caribbean country.